Il Sole alle Spalle by the new Italian band Sintesi del Viaggio di Es is the last of the batch of Lizard Record releases I received this spring. 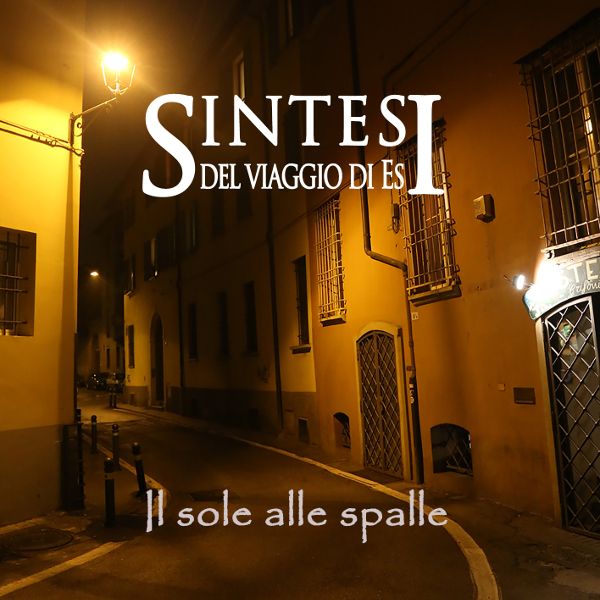 Sintesi del Viaggio di Es is Nicola Alberghini (drums and percussion), Marco Giovannini (vocals), Eleonora Montenegro (flute and tin-whistle), Sauro Musi (electric and acoustic guitars), Maurizio Pezzoli (keyboards), and Valerio Roda (bass), with Valerio, Marco, and Sauro coming from the 70s Italian prog band Sithonia. Il Sole alle Spalle extends what Sithonia started in the 70s and 80s through to today. Valerio wrote all of the music and lyrics for the eight songs on this album. The result is beautiful Italian prog with more than a passing reference to Le Orme. I think that it must be Marco’s exquisite tenor that draws most of the comparisons. Then there is Eleonora’s beautiful flute interweaving throughout that enhances the poetic sweetness and occasional bucolic passages of the music. I particularly enjoyed “Il Patto non Scritto” with its fantastic organ, electric guitar, and inspired synths that build to a wonderful climax. And the closing title track is tour de force 15-minute symphonic prog rock suite. Il Sole alle Spalle is sure to please all fans of classic Italian prog rock.